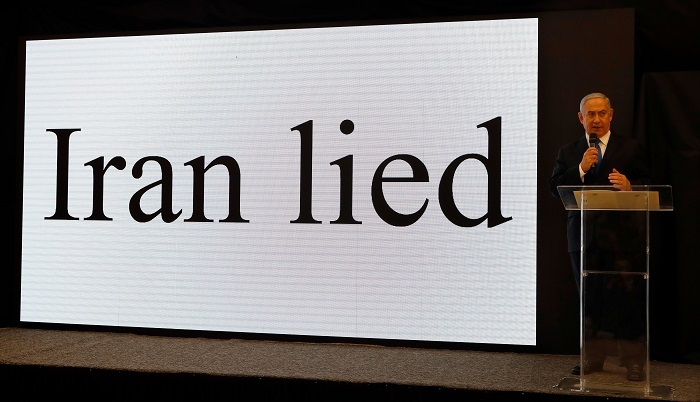 Israeli Prime Minister Benjamin Netanyahu held a televised address that was part news conference, part reality show and part TED talk, in which he revealed a trove of over 100,000 files and 180 CDs full of data allegedly from the Iranian regime’s “atomic archive” detailing its program to design and build nuclear weapons in a program code named “Amad,” which ended in 2003. The revelations in and of themselves were not too surprising since the Iranian resistance movement originally revealed the existence of the nuclear program and has been regularly exposing regime’s nuclear activities including revealing secret military sites where the regime conducted tests for high explosive detonators. The National Council of Resistance of Iran, the leading dissident organization, has held its own press conferences to unveil smuggled documents, videos and photos of the regime’s nuclear program so what Netanyahu unveiled demonstrated a flair for showmanship, but didn’t shake the earth with new information. But what was underscored is the simple truth that seems to have eluded many news organizations who were taken in by the PR push by the Iran lobby, especially the National Iranian American Council, which is that the regime has consistently lied about its nuclear program. During the run up towards the Iran nuclear deal, the NIAC always maintained that Iran was not actively building towards a nuclear weaponization program but was instead building a civilian nuclear program. It tried to justify the weak inspections regimen by contending the Iranian regime wasn’t pursuing a bomb anyway, but the agreement would ensure that one could be postponed by a decade or longer. Since the agreement didn’t include inspections of Iranian military sites, those assurances could never be fully realized and the Iranian resistance movement and Netanyahu’s disclosures only verified what was arguable one of the worst kept secrets that Iran was in fact trying to build a bomb, but somehow that past coverup never was called out as a reason not to trust verification by the regime under the deal. The most explicit example of that conundrum was in the clean-up of Parchin facility before international inspectors could visit the site in 2015. Classified satellite images obtained by the U.S. government showed bulldozers and heavy machinery working at the site which was used by the regime as part of its nuclear program. Of course, NIAC issued a statement by Trita Parsi that skirted the issue of Iranian lies and instead focused on the one thin shred of hope it has left before President Trump decides whether or not to decertify Iranian compliance with the deal by the May 12th deadline. “Anyone familiar with the history of Iran’s nuclear program or the Joint Comprehensive Plan of Action will not be surprised by allegations that Iran had an active nuclear weapons program fifteen years ago. Those well-known concerns were the reason why the international community negotiated an agreement to limit Iran’s nuclear program and subject it to intrusive international inspections,” Parsi said. Three years later we know now that Iran merely used the nuclear deal as a tool to gain access to billions in badly needed cash to save its military adventures in Syria, as well as launch its ballistic missile program. While it didn’t come as a surprise that the mullahs lie, it was a useful reminder moving forward that Iran has to be held to a different standard, akin to North Korea which broke every international agreement it entered into until President Trump decided to play hardball. Again, the NIAC tries to stoke war fears in order to dissuade public opinion from taking harsh action against the Iranian regime. “Amid an already ruinous regional proxy war in the Middle East, a war against Iran could be even more disastrous for global security than the 2003 invasion of Iraq. Iran is nearly four times the size of Iraq, with influence in military conflicts from Syria to Yemen and with missiles capable of striking U.S. ships and bases in the region. Bombing cannot erase Iran’s nuclear know-how and would only empower those in Iran eager to obtain a nuclear deterrent. Moreover, it would set the region aflame and draw the U.S. into a prolonged quagmire that would cost American blood and treasure and set U.S. security back decades,” said NIAC’s Ryan Costello in a statement. It’s remarkable how many misconceptions are in that one paragraph. First and foremost, he neglects to mention that the Iranian regime is the only one responsible for the “ruinous” proxy war engulfing the region through its support and control of the terrorist group Hezbollah and its use in Syria. It is gratifying though for Costello to admit Iran has developed a ballistic missile capability aimed directly at U.S. military bases but falls flat on his face in supposing the U.S. aim is to fight a war with Iran. If anything, President Trump has been an outspoken opponent to using U.S. troops in the Middle East, being a frequent and harsh critic of President George W. Bush’s decision to invade Iraq. President Trump has made it clear that his desire is to use the punitive power of economic sanctions which brought Iran to the bargaining table in the first place before the giveaways began under the Obama administration to appease the mullahs. The threat of war doesn’t come from the U.S., it comes from Tehran and the mullahs there for are becoming increasingly desperate to hold onto their power. What NIAC won’t tell you is that it isn’t worried about the threat of war, but the threat of renewed economic sanctions coming at a time when the regime is as weak and vulnerable as it has ever been. The prospect of regime change under those conditions is what terrifies Parsi and Costello and their comrades in arms.